I once again found myself experiencing ‘keuzestress’ which is the Dutch word for choice stress. You see, I would like to buy myself some mascara. I would like to pick one that suits my needs. But considering I never was a very girly girl and I mostly go out without any makeup (“Nooo! You actually do that? !”) I’m not that experienced in picking the correct one. If there ever is such a thing. When I go to a shop and see all those brands recommending all their products I just go blank. There’re just too many of them. You can choose one that adds volume, or one that adds length, or one that separates your lashes. One that adds volume and length. Or one that adds volume, length and curl. Or one that adds volume, is waterproof and for sensitive eyes. Well, I can’t spend the time trying them all, I would be in that shop for hours. And I can’t buy them all, there’s just too many and I just need one (or two). So, since I’m a sucker for stylish gadgets and graphic aesthetics I tend to choose my purchases by how something is presented and also I don’t want to spend a lot of money on it so eventually I’ll just buy one that’s on sale. But I just want mascara that does what it is supposed to do: show people that I actually have lashes and hide a bit of my everyday tired-mom-look when I go out for work or for fun. 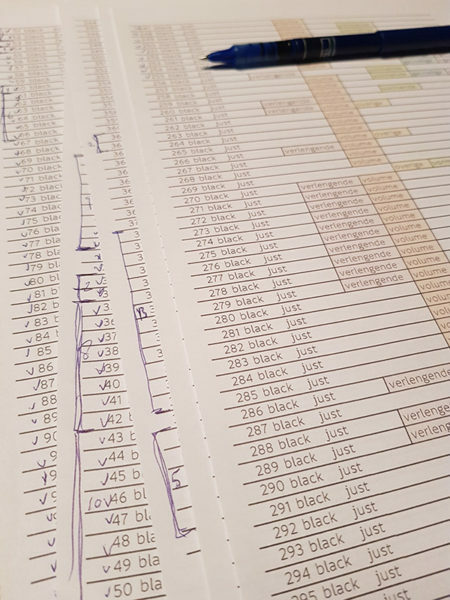 Now here’s what I did: I scraped the data of a Dutch makeup webshop on all the mascara’s they supply* and then I sorted the data on the names, brands, colors, the effects/characteristics of the mascara and if they are specified as waterproof and/or suitable for sensitive eyes. Then I put my focus on color and the characteristics of the mascaras as I did not want to choose based on brand. So to give you (guys!) an idea of the amount of mascara available on this website I created this randomly ordered datavisualization containing 390 black mascaras. Not only ‘regular’ black but also the ‘most’ black, which I found out is described in various ways like max, very, extra, rich and yes, the blackest black. (there are also various other blacks such as choroal, espresso, leather, asphalt, onyx, etc. but these I just stacked under ‘regular’). For those who can’t handle the randomness of above visualization, here’s another one neatly ordered by effect/specification. 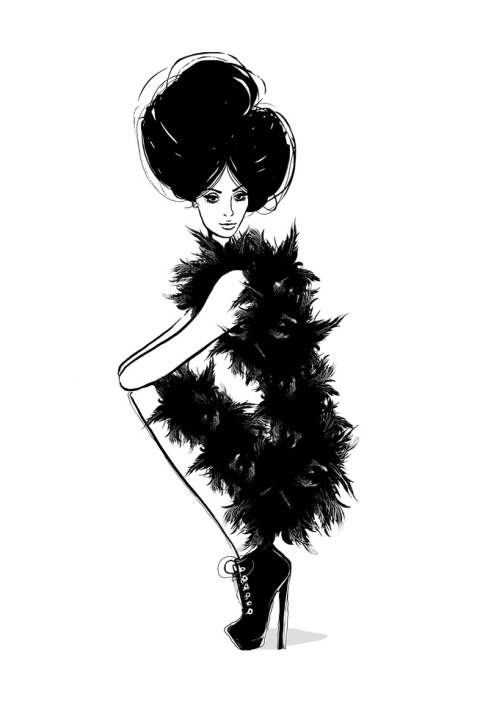 a fashion illustration by Megan Hess and a ‘Swiss style’ font design by Rosmarie Tissi. And I’m very fond on using circles in my datavisualizations. Although not intended, somehow I came to arrange the 7 characteristics in a way that together they resemble an eye. Which could be considered lame but I actually like it. When you look at one single symbol which has less characteristics it doesn’t directly relate to an eye though. A sidestory which is worrying to me is something that Iliza Shlesinger talked about in her comedy show Freezing Hot (2015). She has a topic (at 00.50h) on how society operates on a currency of women’s insecurities and “having them suss out what’s good and weed out the positive messages”. Iliza then gives an example on how this is designated in the names of makeup (BADgal). You can choose looking like a vampire (I don’t want to drink someone's blood! ), like an angel (I’m not dead yet and well I have my flaws) Or you can look like a celebrity (which one?! ), like a baby doll (you mean childish and artificial? ), like a badgal (‘because I’m bad, I’m bad, you know it”), like a rebel (YEAH! ), fatal (like in killing something/someone?) or amazing (yes, you’d want people just to be amazed by you for the kind of mascara you put on). Truly Waterproof - The other waterproof mascaras aren’t really waterproof? Respectissime - This comes from good intent I guess but I had a how-to-pronounce-it discussion with my partner: where does the emphasis go? Hypnose - Now that would be something, if you could just put on some mascara and go on hypnotise people to make them do stuff for you, what a potential!. Could be some secret weapon. If they only not name it like that. Cheater - Don’t leave that one lying around. I will not go for a crusade here but the messages are confusing and simply stereotyping. Luckily there are plenty more names that only tell something about their purpose: full volume, natural look, false lash look, multi-effects. Still confusing if you’re not such a regular user of makeup. At least now I made up my mind by exercising the data. Hope it will be satisfying. purely as a fun exploration and do not communicate/share these as facts.